A person intensely interested in a particular field or hobby, generally at the expense of broader social interaction. Often used with an attributive noun. I’ve been thinking recently about how ‘geeks’ are becoming more and more mainstream. It’s odd seeing pictures of friends from school going out to Ibiza and dressing up as ‘geeks’. Often now it’s becoming a look or a badge of honour, something hard to attain. I can hardly believe that geek chic has become an accpetable look. On twitter people profess to be geeks or nerds and low and behold they end up asking about how to recover a lost document or don’t know how to plug in a mouse. It’s not enough to know what lolcats is or to use a hashtag. It’s not enough just to wear big glasses and slag off Comic Sans. That’s just web culture and as good and fun as that is, geek culture is a whole other level up. Or am I completely wrong? Am I just annoyed that my precious little world is being seen for how great it is and should welcome all the newcomers? Even if they didn’t spend years at school getting looked at funny because you knew what hexadecimal was or what all those other buttons on the calculator actually did? (The picture above is the one of the calculators I had doing my A-Levels, a casio fx-9750g). Bought one of these with money for my birthday last month. Might be one of the best things I’ve ever bought. Seriously. On Friday we travelled down to Oxford to attend the reception of Ed & Meleri’s wedding. We had a lovely time and it was nice to see some friends that we don’t often get the opportunity to see. Ed & Mel met whilst at University and I met them about a year after first going out with Kate? Something like that. It’s funny the difference in them between then and now, back then they were wondering whether or not to move in with each other and whilst to us it was clear that they were in love with each other and a couple that were very very good together it seemed to me like they hadn’t quite discovered it for themselves yet (I have no idea how long they had been seeing each other at that point). We used to all meet up for parties at Kate’s sisters flat in London and seven of us would be staying in her 1 bed ground floor flat, having had some good food, lots of drink and silly games. After a bit of a palaver in trying to find out what name our room was booked under we check-in to the lovely hotel (which had a spa! If only I’d checked beforehand!) We had some food in our room and went down to the reception for 8.
iPhone OS 3.1 now enforces Exchange encryption policy, may block pre-3GS iPhones – bummer. Work just went to Exchange. Oh well need an iPhone 4 then. The real IT Crowd: how true is the C4 sitcom? – At the same time, this article is right and very very wrong. I work in one of the geekiest places in the city, nay north-west and I've seen the full range of IT people. The IT department I work in is bigger than most SME's. It’s been a while since I’ve done a movie post (or any sort of regular post) but I suppose it’s been a while since i’ve been to the cinema. 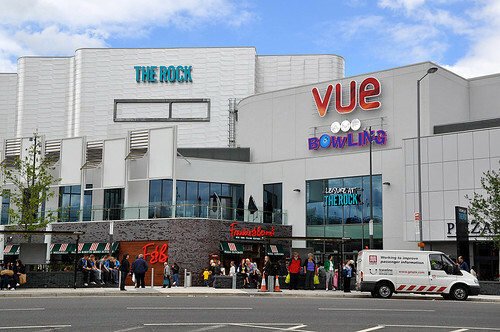 Last week the new shopping centre/street opened in Bury, this meant that our old cinema in Pilsworth closed down and moved to it’s new premises at The Rock along with the bowling alley and a couple of restaurants that were there. I think that it makes a lot more sense for them to be in town. It always felt a little quiet in Pilsworth. We were meant to go on ‘Cheap Day Tuesday’, we turned up for the screening and the place was packed. We were only ten minutes away from the start time so we thought, you know what? We live about 5 minutes away now so we’ll just come back another time. Parking is free after 6pm so nothing lost. I bought the tickets online for the next day for the 1640 showing (you get 25% off tickets where the showing starts before 5!). Now it takes me about 40 minutes on average to get home from work which I finish at 4 and yesterday it was pouring down which always helps the traffic.. I managed to get to the cinema car park for ten-to and after a bit of an ordeal queuing for popcorn (don’t think people have quite got the hang of it there yet, instead of one big queue that moves quick there’s lot’s of little queues that all move differently, so go to the wrong one like Kate did and you just watch others fly by). Kate’s journey to the cinema was massively simple, she works next door to it. And so to the film, we managed to get there in time for a couple of trailers which kept me happy (I hate missing them). A-Team, Harry Potter and then the film started just after 5 o’clock. I’ve been a Christopher Nolan fan for a long time, since I first saw Memento. It was probably around 2002 I saw the DVD and I’ve watched it over and over so I look forward to any film he’s got coming out. The recent Batman films have been especially enjoyable, not so much with The Prestige. I kept getting shown the trailer for Inception at work the effects look great and the cast awesome. It’s funny how Leonardo DiCaprio is becoming one of the greatest actors of our generation. He just keeps making cracking films, I really liked Shutter Island – anytime he gets with Scorsese you know something good will happen. Cillian Murphy was great and Ellen Page was really good in it. Oh and Tom Hardy (Handsome Bob in RockNRolla, Praetor Shinzon in Star Trek: Nemesis and Charles Bronson in Bronson) he’s really underrated I think, one of Kate’s favourites. But I think what I liked the most about it was despite the story being complex and full of meta and what is reality really, which is probably one of my favourite concepts to explore the laws of the films universe did make sense and you could quite easily accept what was going on and I didn’t find that it jarred my suspension of disbelief. Cobb’s (DiCaprio) inner struggle of course drives the film, his desire to get back to normality whilst getting dangerously getting close to driving himself crazy in order to do so. It’s a classic story really, told in an innovative way. It had shades of Old Boy in it where the protagonist has spent a lifetime within a lifetime (also the basis for a Star Trek: TNG episode). But that’s not the central tenet to the film. Anyhoo, I would fully reccomend it. I look forward to it coming out on Blu-Ray. There was a post today on Evil Mad Scientists listing their favourite tools for the job. So I thought, hey that’s a good idea I can steal! So I’m going to present to you my favourite tools for the data centre. Just so so useful. I walk into the data centre sometimes not knowing what I might need and it’s a pretty long walk back to the office where the tools are. So I bring this guy along just in case and nine times out of ten – it does the job. Maglite 2AA cell. It doesn’t have to be the LED one, I just like it. The modes aren’t particularly useful to me but you never know one day you may need to have it on SOS mode (which If you’ve read Cory Doctorow’s When’s Sysadmins Ruled the Earth you might be able to envisage). Our data centre has a lack of lighting at the top end so it’s good for that as well as being essential for seeing with when you are crawling around the floor. I also carry a Maglite Solitaire on my keys in case i’ve forgotten to bring a proper torch with me. You’ve got to have good crimps. I used to have on that did cutting, stripping and crimping in one tool but the stripping bit started to wear out so I’ve now decided that separate tools are better. I keep getting the bit of skin between my thumb and first finger caught in our current one so I’m not going to be reccomending that particular model. Because using your teeth gets tiresome and wearing. We use one that you poke the end of the cable through and twist it round. Believe it or not these can get pretty expensive. But with good reason, several times i’ve cut out a power cable that’s out of use but stuck in a rack through over zealous cable management and it’s been still connected to power. Flash and a bang later and you’re glad that the snips have done their job and insulated you from it all. Go for the double, single suckers aren’t enough often. We had a couple that had slight hinges on the suckers but they wore out pretty quickly. For lifting vented tiles I usually use the pliers on my penknife. Stops the user complaining about their dodgy network connection when you can show them that there’s nothing wrong with the cable you spent time crawling under the floor to install for them. I could go on about how my iPhone has helped me in situations, which it has – often to get to the universities phone directory, make sure a DRAC card I’ve just set up is pingable. But until the university sorts it’s wireless out so I don’t have to re-authenticate every time I use it it’s actually much easier to troop back to the office to use my PC.